Some of my lily-livered friends and even some family members are starting to quiver and shake like the breasts of a sumo wrestler in a bumper car competition at the absurd notion that Donald Trump may actually win the Presidency. My wife won’t even turn the TV on anymore and forbids me to turn it on if she’s in the room for fear that she will hear some good news for Trump or bad news for Clinton. All this quivering, shaking, and deranged avoidance are due to Trump’s having pulled ahead a bit in national polls. Okay, here’s a news flash: The U.S. is a highly polarized society. Roughly half of Americans are actually stupid enough to vote for Trump, so of course the national race is tightening as Election Day approaches, at least in the opinion polls. But you have to keep a couple of things in mind. First of all, Americans don’t vote in large numbers. In the 2012 election, 57.5 of eligible voters actually made it to the polls. Although there are no voter IQ statistics, it’s a fair bet that a large portion of the eligible voters who never manage to vote come from the stupid half. Of course, large numbers of eligible, not necessarily stupid, young voters don’t end up voting, but that’s because they actually have much better things to do. Then there’s the distribution of the stupid voters. Extremely stupid voters are slightly outnumbered in the states that count: Colorado, Florida, Michigan, New Hampshire, Ohio, Pennsylvania, Virginia, and Wisconsin. Elsewhere, stupid voters make up solid majorities, but not enough to make a difference in the Electoral College. Then there are the groups, including the stupid among them, that Trump has permanently alienated (besides the African Americans and Hispanics he never had in the first place): women, including half-way intelligent Republican women, people with disabilities and their family members who resent those with disabilities being mocked, large numbers of veterans, especially ones who were POWs and resent the notion that soldiers who get captured are losers, nearly everybody with a college education from a non-fundamentalist Christian college, and Ukrainians. Ukrainians? Yes, Ukrainians along with other Slavic groups such as Poles and Slovaks, many of whom have been reliable Republican voters since they became Reagan Democrats in reaction to the draft-card-burning, antiwar counter culture of the 1970s. A large part their Republicanism has been anti-communism. Now Trump comes along and praises ex-KGB chief Vladimir Putin to the skies and suggests Putin has every right to gobble up parts of Ukraine. Excuse me, Comrade? To these often working-class ethnic voters Trump’s hairdo is starting to look suspiciously pinko. Then there’s the clown factor. Even stupid voters have a strong survival instinct. It’s not hard to imagine an enthusiastic Trump voter who isn’t completely insane getting into the voting booth and thinking, “Wait a minute. Do I really want this clown to have his stubby little fingers on the nuclear button? Sure, he thinks and talks like me, but would I want me to be President?” When the chips are down, such epiphanies can happen. So I say to all my quivering, shaking friends and family: Relax. 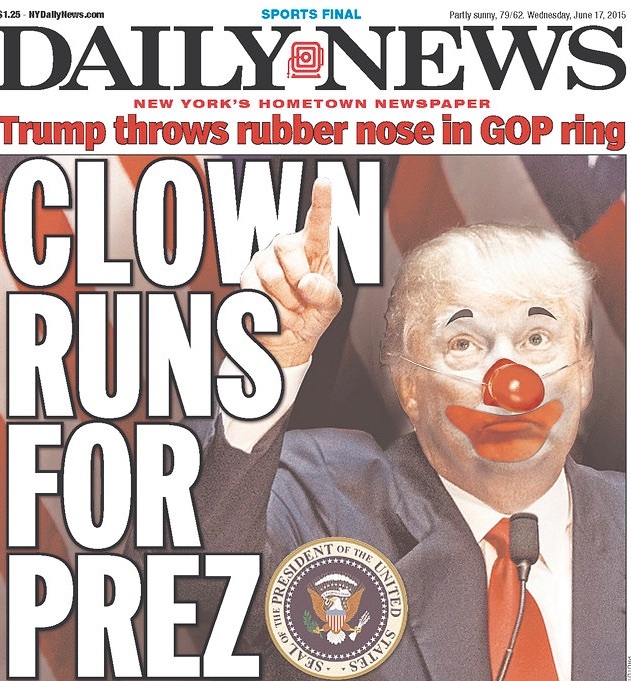 The clown with the orange skin, ridiculous comb over, and big mouth is never going to be President. Are you really as relaxed and laid-back as you let on, Alan? From your lips to God’s ears .